The system features an 8th Gen Coffee Lake 2.6 GHz Intel Core i7 six-core processor, 32GB of 2400 MHz DDR4 onboard memory, a 512GB PCIe-based SSD, four Thunderbolt 3 (USB Type-C) ports, a Force Touch trackpad, a keyboard with a 3rd-gen butterfly mechanism, stereo speakers with double the dynamic range of its predecessor as well as improved bass, 802.11ac Wi-Fi, Bluetooth 5.0 wireless technology, and even a 3.5mm headphone jack. 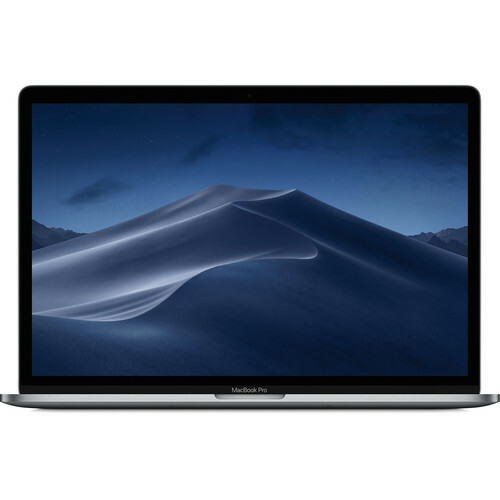 Box Dimensions (LxWxH) 16.1 x 11.5 x 3.6"
15.4" MacBook Pro with Touch Bar (Mid 2018, Space Gray) is rated 4.5 out of 5 by 239. Rated 3 out of 5 by Lisa from Like my old 17 better I like this, but I dont love it. In an effort to make everything better, I think they have gone too far. I guess Ill get used to it. I hate that I the track pad acts of its own accord sometimes... I have my thumb over it, not touching it, and it changes the screen. If you learned to type rather than hunt and peck, your left thumb if over the pad... not good. I dont like that I cant put a CD in it either or that I have to buy new plugs for it and everything I want to hook up to it. I do like the top bar that changes and highlights things you might need and I like the fingerprint ID. But, I miss the machine doing what I wanted it to do rather than it making me do what it wants me to do to get the job done.